Getting out and enjoying something fun on your self-catering holiday in the Lake District is a great way of ensuring your holiday is truly memorable. Fun activities include everything from thrill seeking adventures to trips down memory lane and opportunities to see unique and unusual attractions which exist nowhere else in the world. Below we’ve picked out some fun things to do in the Lake District for all kinds of travellers. Visiting Windermere is always a wonderful Lake District experience but the area comes into its own by water. 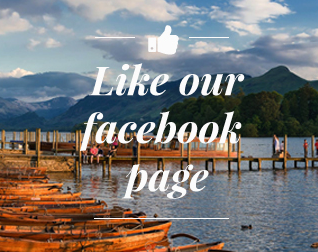 With more than 10 miles to travel, between Ambleside and Newby Bridge, you can spend a leisurely morning or afternoon upon a Windermere cruise boat with the opportunity to jump off wherever takes your fancy or simply go up and down enjoying the views. A quirky and unique place to stop, which certainly makes it fun, The Pencil Museum in Keswick is an unusual place to spend an hour or so. Not only it is home to the world’s longest pencil, it also tells a fascinating and interesting story about the history of the pencil, the most used stationery in the world. Pencils actually have close ties to the Lake District as graphic was first discovered nearby in the 1500s and Derwent pencils are made locally too! For a fun indoor adventure, King Kong Climbing Centre offers something for climbers of all experienced. It’s based in Keswick and has challenges hard enough for experienced and toughened climbers as well as activities for younger children. It features a thrilling ice wall and the centre offers everything from guided taster sessions to unsupervised access for experienced climbers. Indoor ice climbing is not something you can experience just anywhere. With the chance to hand feed many of the wild animals, from giraffes to kangaroos, and see others including tigers, leopards and jaguars, South Lakes Safari Zoo is a must-visit attraction for animal lovers. Huge enclosures with free roaming for the animals makes it easy to get closer than usual to many of them and there is also a dedicated condor and vulture enclosure which gives you the chance to view these giant birds in their near-natural environment. Many people visit the Lake District and got to the Beatrix Potter attraction but only her biggest fans make sure to visit her home too. Her farmhouse, near Sawrey, is where she created some of her most famous and best-loved stories. The house was bequeathed to the National Trust after her death and as you explore the home you’ll see many of the features from the illustrations for her book. Mrs Tiggywinkle’s kitchen is perfectly replicated in the home as is Mr MacGregor’s famous cottage garden. Cartmel’s Predator Experience is much more than your average falconry centre. You can book ultimate predator experience days and enjoy many opportunities to get up close and personal with some of nature’s most formidable predators. Many experiences are for over 16s only and it is a chance to enjoy a wide range of fascinating predators. Wolf walks and fox experiences can be enjoyed alongside falconry tuition and there are even occasionally more exotic big cat experiences available. Unique, quirky and surprisingly charming once you get to know them alpacas are a fascinating breed. The Alpaca Centre is just outside the borders of The Lake District but certainly worth visiting to meet these fun and charming animals. The centre is completely free to visit and there is a shop/visitor centre with plenty of alpaca themed goodies, including clothing made from their soft, beautiful quality wool.